This is the happiest photograph ever! 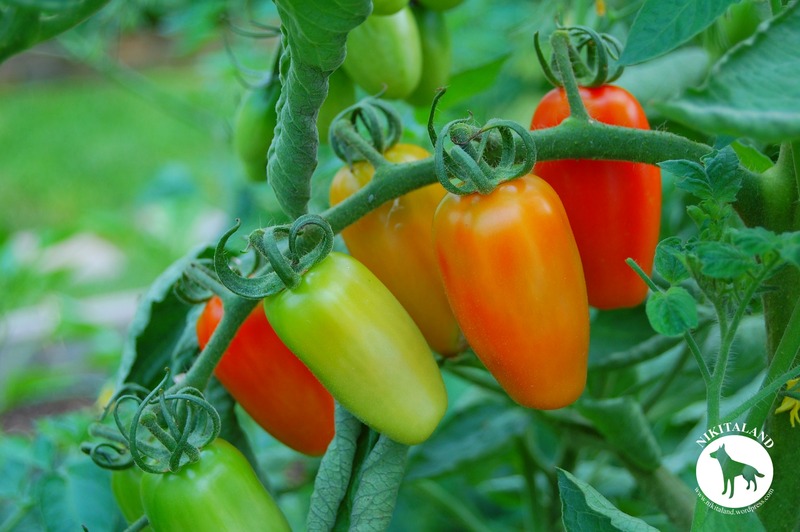 Look at the variety of colors on the Juliet Tomatoes! This is a sight that we have been waiting for! 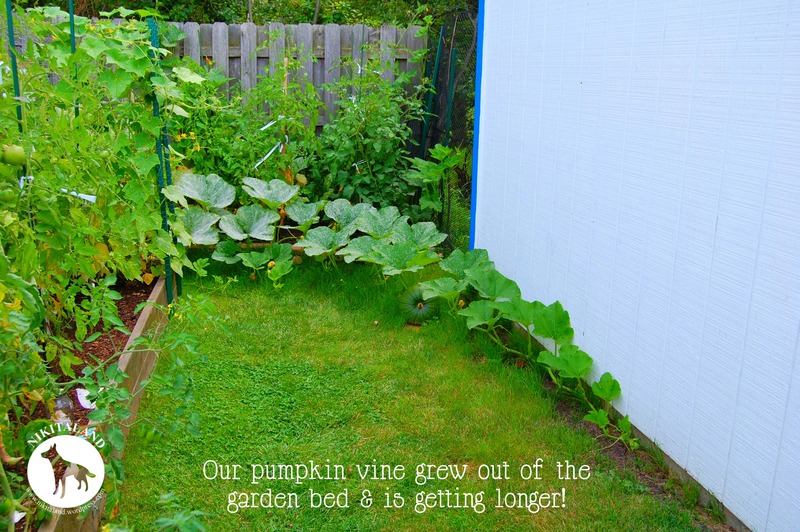 This is our one pumpkin that is outside of the garden bed that we get to watch grow. 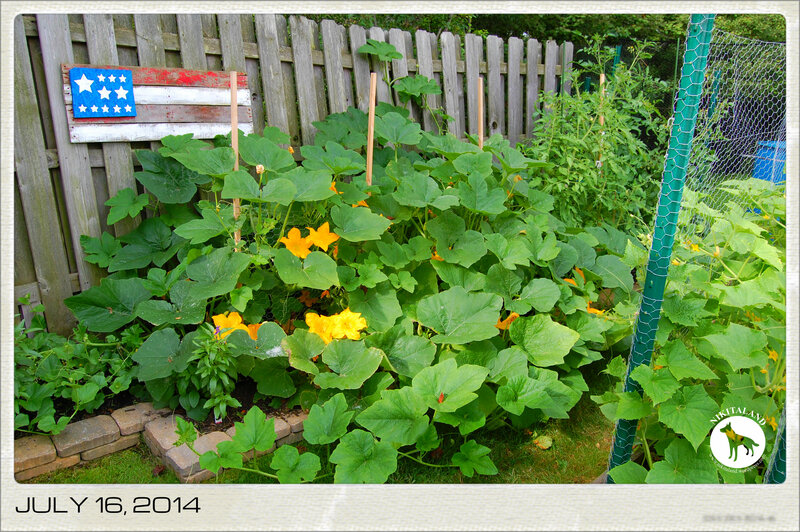 I decided to take photographs of this pumpkin every four days so we can see how much it has grown. In this collage, the first photo is on 7/20, then 7/24, 7/28, 8/1, and on 8/5. It is coming along nicely, don’t you think! 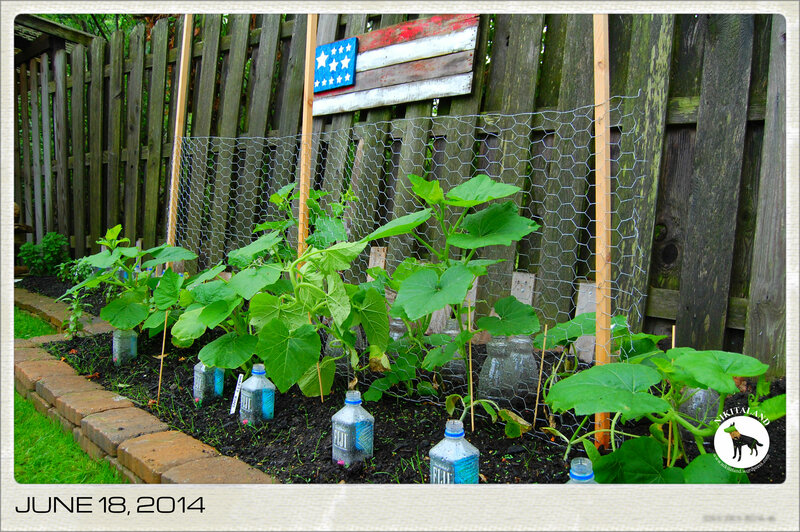 Watching our pumpkin vines grow is fun! The only thing that I get upset about is when I see a new little pumpkin on a vine, and it turns yellow before the female flower can get pollinated. Bummer! 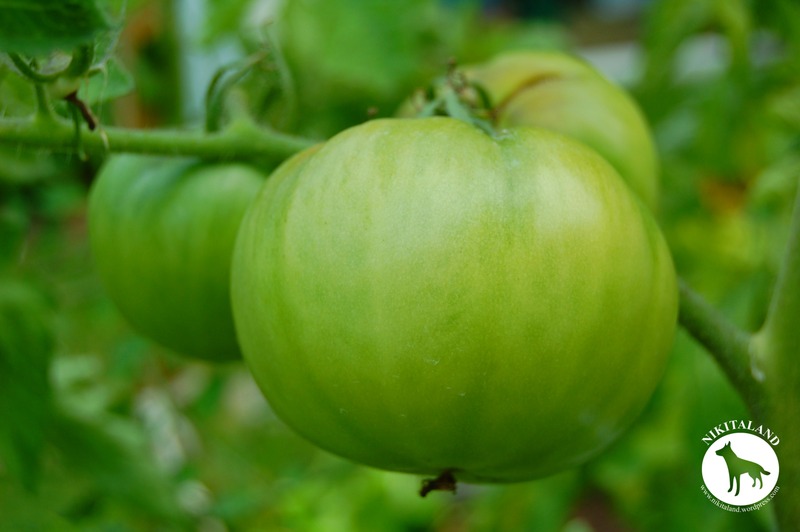 Some of our Big Boy Tomatoes are starting to ripen! What a nice sized tomato! 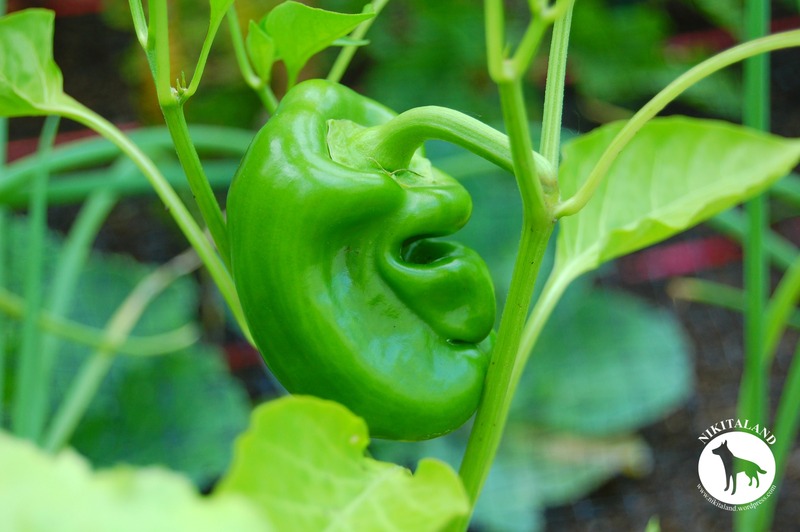 Our Red Pepper plants are growing some strangely shaped peppers. 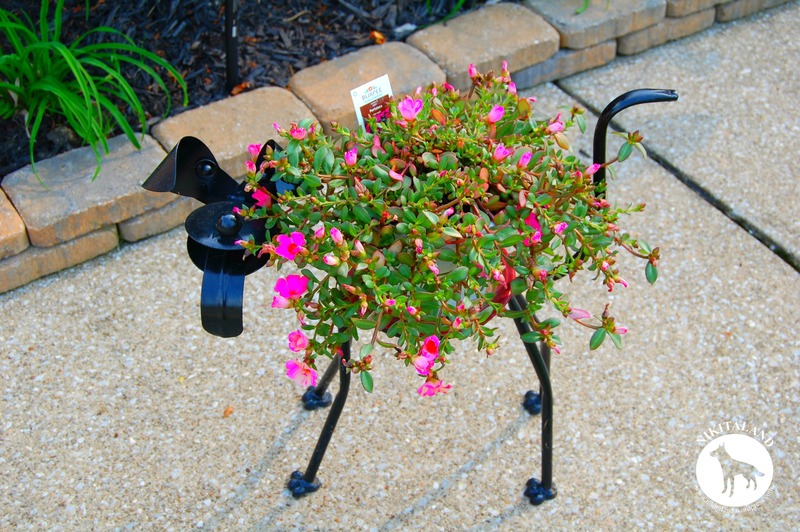 I put my Portulaca plant on my little doggie planter and it looks so adorable. After finding 10 small Horn Worms in our garden a few weeks ago, we found this HUGE one over the weekend and freaked out! Holy crap! 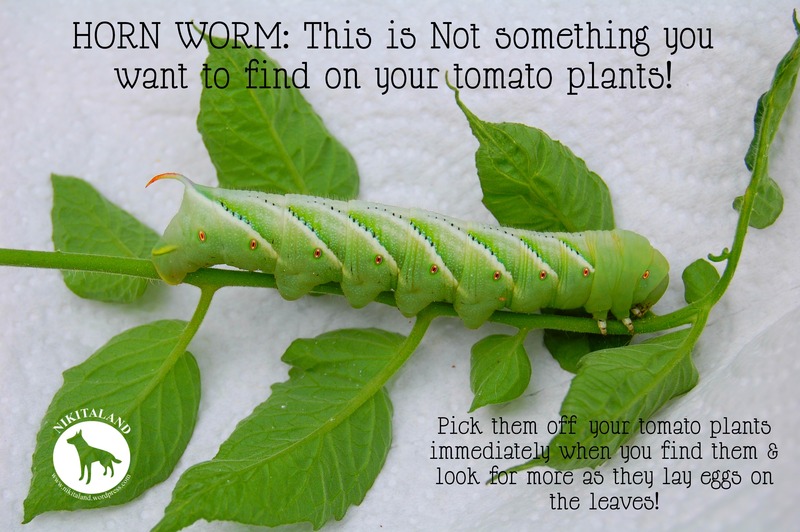 Every day, multiple trips out to the garden to check for Horn Worms is a must, since we know we have an issue. This one we cut the small branch it was on, and immediately placed it into the jar where I threw all the other ones to die. While it was in the jar, I watched it quickly munch down this entire branch in a matter of minutes. Minutes, people! Minutes! 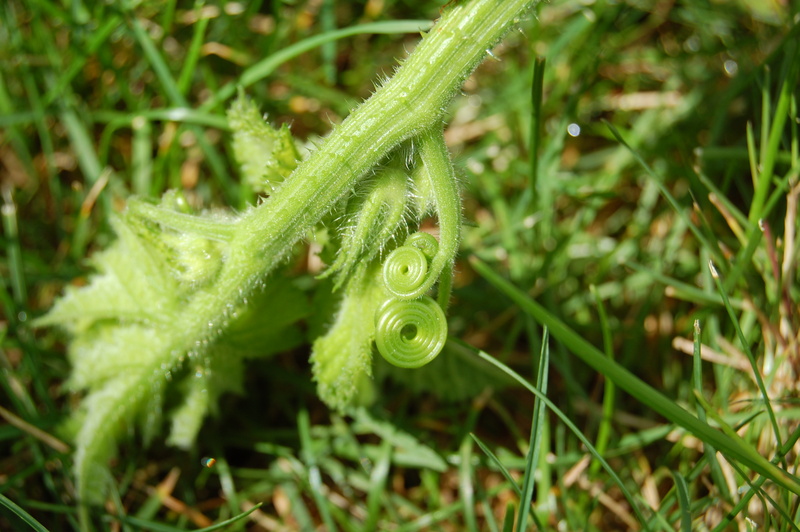 That is why it is so important to find and remove them in your garden immediately. 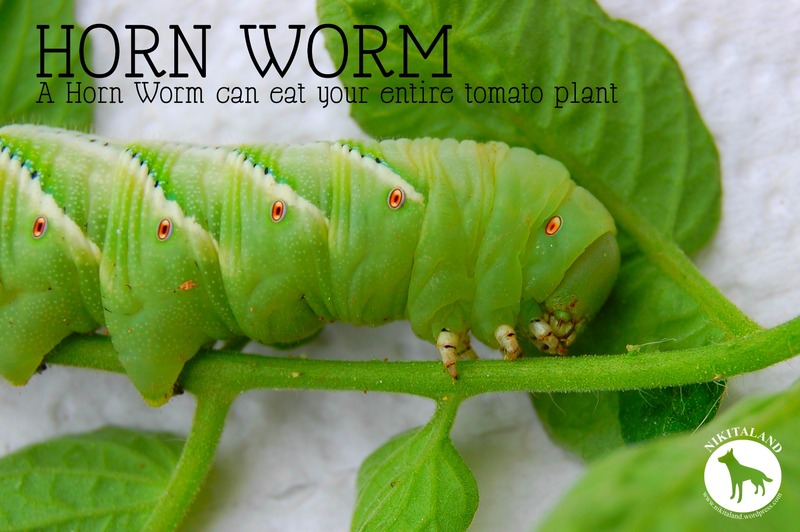 Look for any Horn Worm piles of poop on your leaves, and look for little white eggs too, as this is a sign that you have a Horn Worm in your garden! Act upon it immediately! I am so grossed out by this close up photo. If you click on the photo you can see it’s teeth better but I hope you did have anything to eat because you might get sick. Those little orangish rings on its side is how it breaths, and it has nine on each side of its body. Gardening for us this year has gone to the bugs, and we are doing our best to keep on top of this problem. Every year we deal with “something”, and this year is no different, just a different problem. I refuse to let these issues take down our garden and all the hard work we have put into it. Where does our love for pumpkins come from? Is it from that little white seed that you saved from last year’s pumpkins that you plant in the ground and watch it grow? 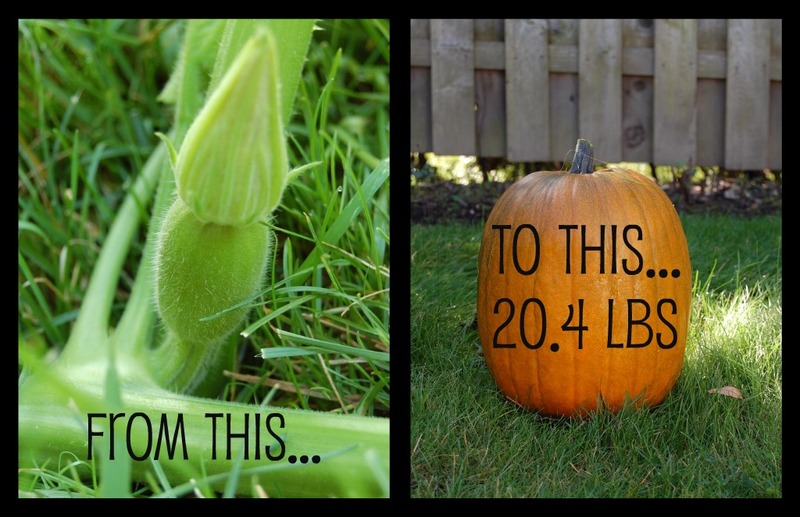 Is it from the idea of what you do with that pumpkin once it has grown? Like carving them into masterpieces! Is it your love for drying the seeds & eating them? Is it from your love for the Fall Season? No matter what your own love affair is with pumpkins, it is all valid. We try to grow a crop of pumpkins every year with high hopes that we can produce at least two pumpkins that we can carve for Halloween. At least that is our goal every year. Last year we failed tremendously with our pumpkin crop. We failed only because we dumped too much coffee grounds around our pumpkins and they died off. Bummer. We won’t be making that same mistake this year, as we learn from all of our gardening experiences. 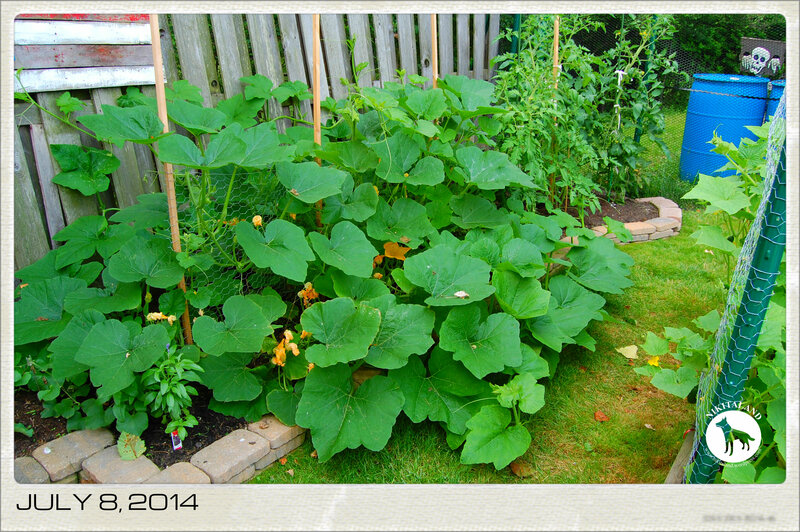 We are about six weeks into growing our pumpkins in our fenced in garden area, and every day we head out back to see how they are doing. We are shocked every day. I told you that pumpkins do a lot of their growing at night, so finding lots of new growth in the morning is not a shock at all. The bees are buzzing around the pumpkin flowers, doing their job pollinating them perfectly, and when they are slacking in their job, I personally pollinate the pumpkins myself with a Q-Tip. Which brings up a thought. 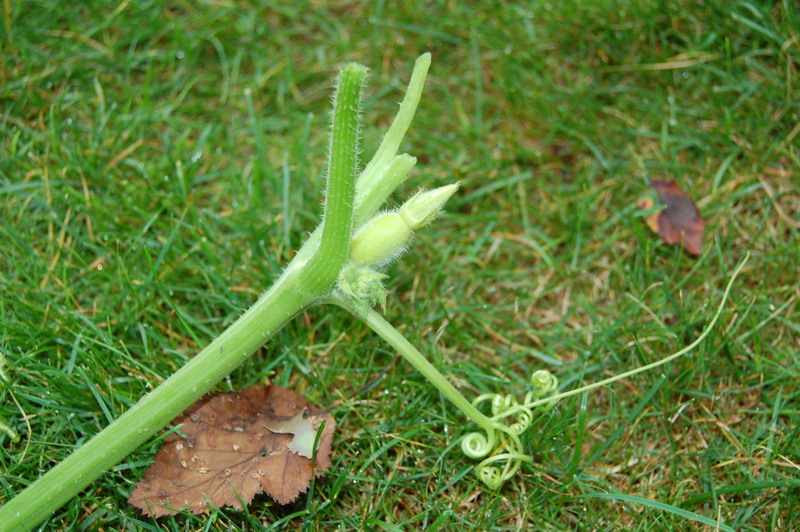 Do you know the difference between a female and a male pumpkin flower? If you don’t know, I’ll tell you…just ask me! 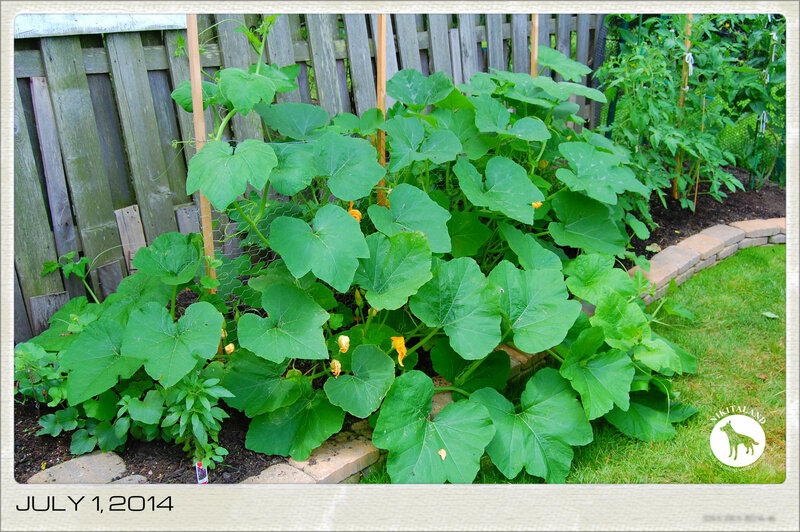 I put together a few photographs of our pumpkins progress, so you can see how well they are growing. We are so pleased! 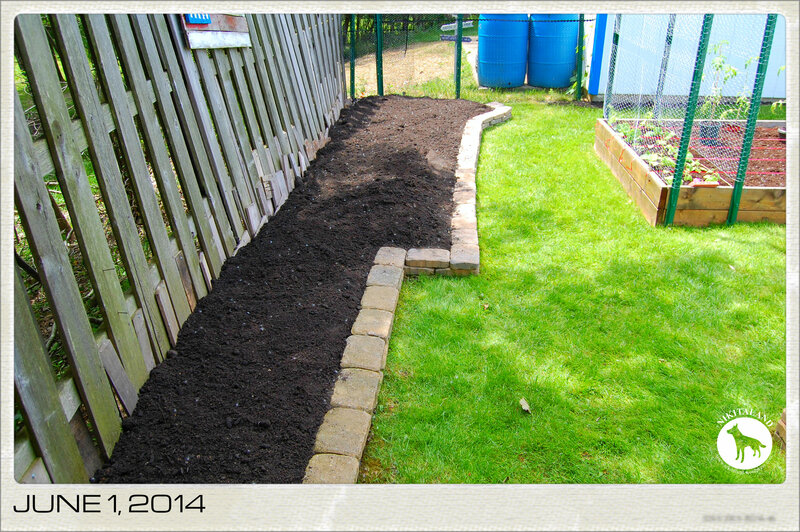 We added more soil to this bed this year, and lots of Miracle Gro Soil. I started 18 pumpkins indoors when I had the grow lights still out. 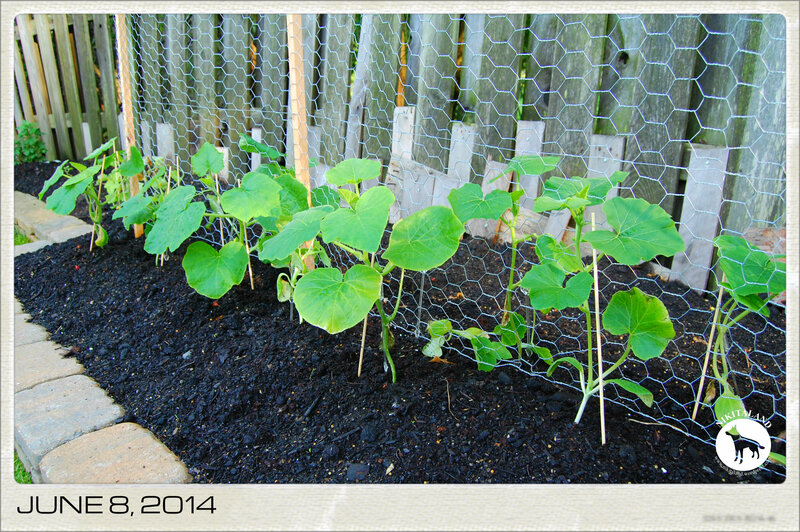 The pumpkins checking out their new home. 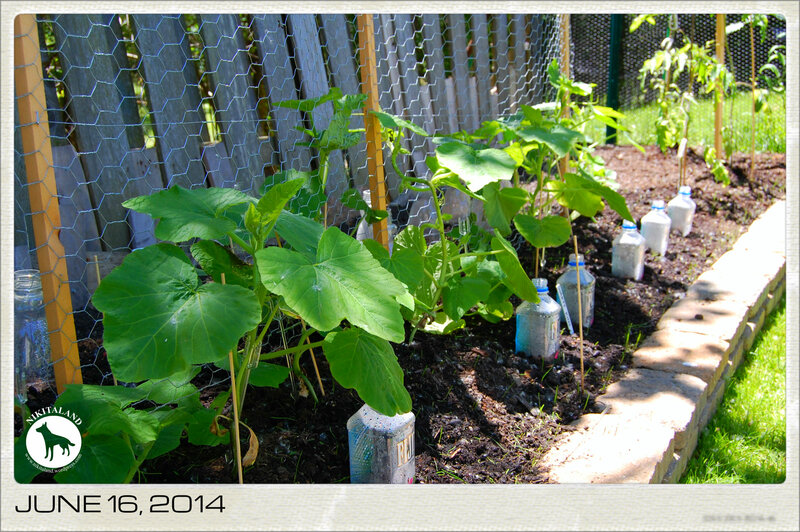 In this photo, I used Fiji water bottles to cover up newly planted cantaloupes, and the water bottles behind the row of pumpkins… are MORE pumpkins. When the pumpkin plant started to grow under the water bottles and got big enough, I removed the bottle. 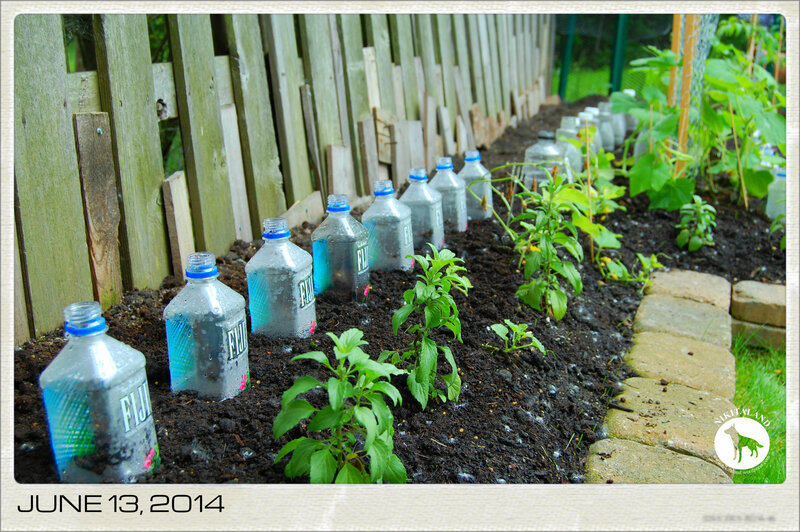 The lids are off all the bottles so the plants got air. 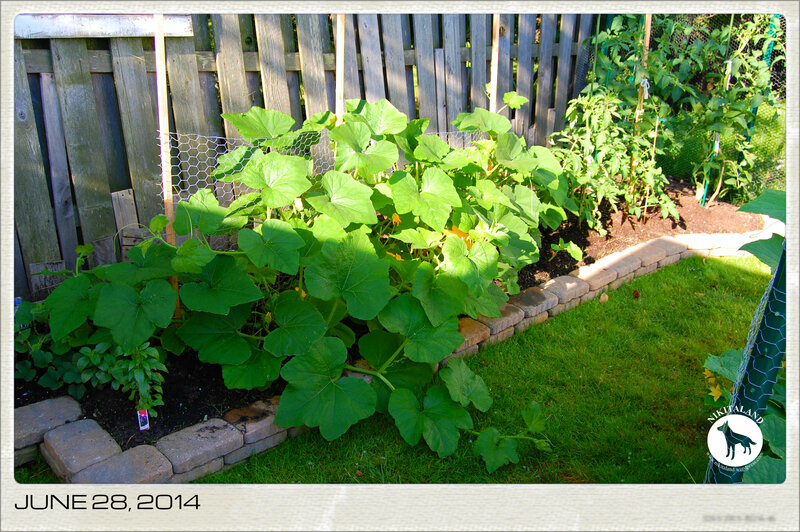 Pumpkins are establishing nicely here. Then all of a sudden…BOOM! It’s a pumpkin explosion! I take it that the pumpkins like this spot this year! Every day we see more new growth! I think we need more space. 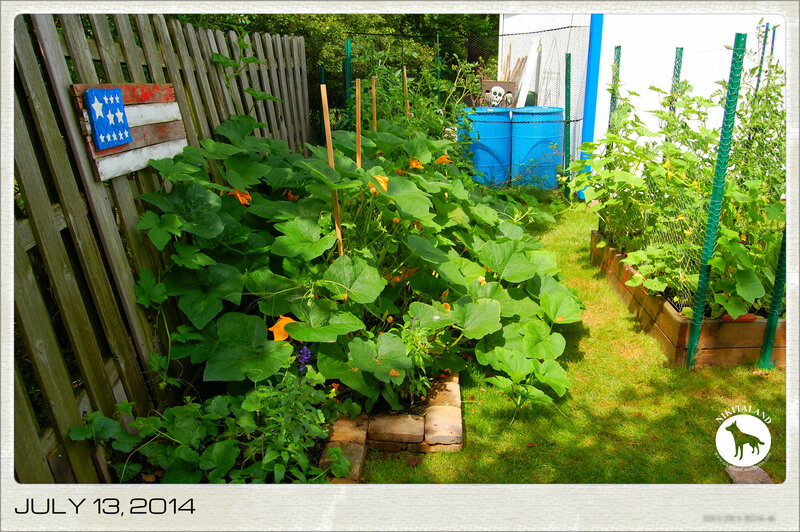 The pumpkin vines are extending everywhere and even up the back of the fence too! 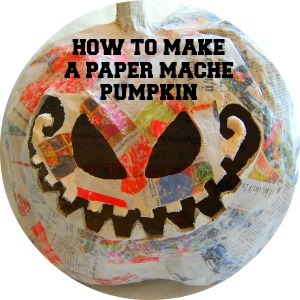 If you need some pumpkin inspiration, check out my Pinterest Halloween Pumpkins Board! So what do you think of our awesome pumpkin patch? 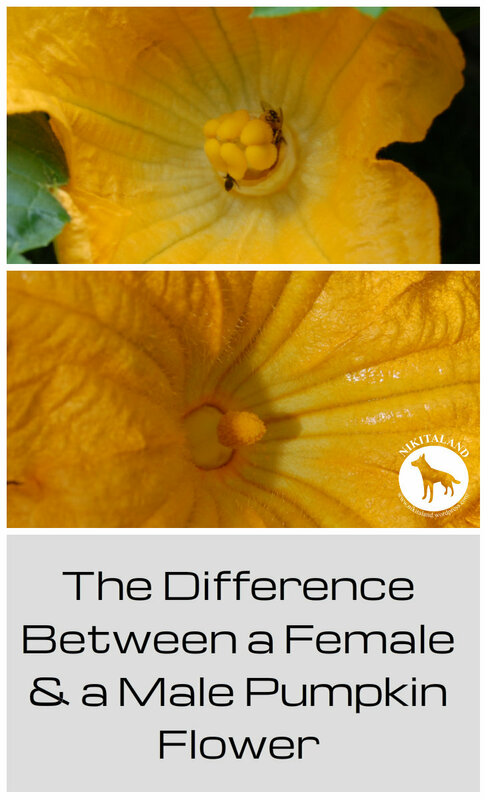 Do you know the difference between a female and a male pumpkin flower? 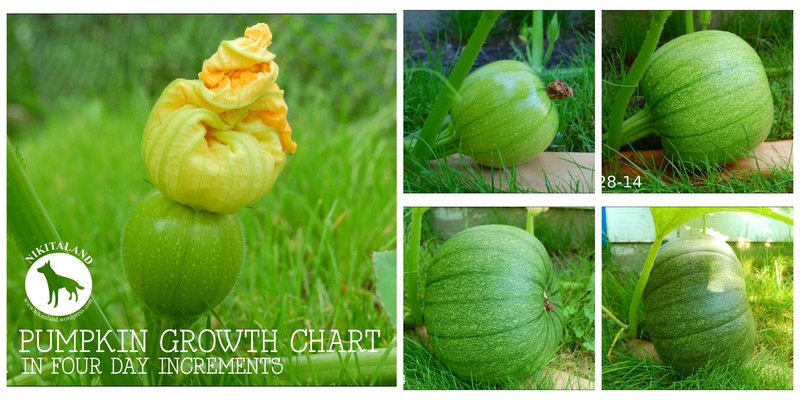 Growing pumpkins in your backyard goes hand and hand with the arrival of Halloween. We decided last year to start growing our own pumpkins just to see what we would get out of our plants, and we were happy to see that we produced a 20.6 pound pumpkin! We had a little problem with some critters (aka chipmunks) that either ate the small plants as soon as they came up out of the ground, or they dug in the dirt to chomp on the seeds, and then we had a deer problem too who ate half of our pumpkin vine one night and stunted the growth of our little kins. So this year, we have once again planted more pumpkin seeds in the backyard like Big Daddy’s, Connecticut Field, and Jack Be Little Pumpkins (the smaler little pumpkins you pick up in the grocery store). 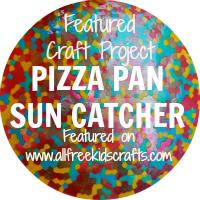 Just the other day while at Petitti’s Garden Center we found the coolest looking pumpkins ever – they are called Red Warty Thing, so we decided to pick up a pack & see what happens when we plant them. The Red Warty Thing pumpkin is just what the name implies, it has lumpy, red-orange skin. 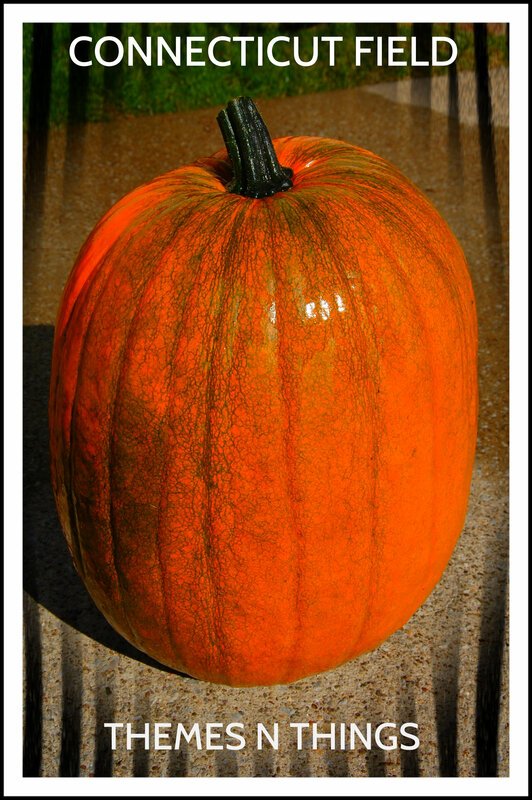 This is a very decorative pumpkin that adds color and rich texture to a fall display. Putting the name aside, Red Warty is excellent for eating with it’s sweet, stringless flesh. How to plant the Red Warty Thing: Planting Depth – 1/2″, Spacing – approximately 6′, Days to Germination – 6-10 days, Weight & Size – approximately 20 lbs and 14″ diameter, Maturity to Harvest – 110 days. So, today we are going to plant some of these Red Warty Things and see what happens and we’ll keep you updated on the progress of them. Wish us luck! 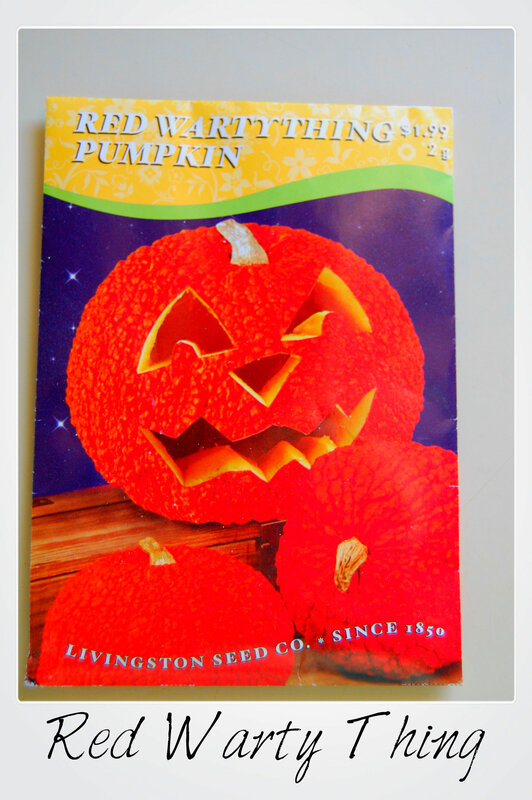 Also, we have more than a 1,000 of our Connecticut Field Pumpkin Seeds available for sale if you would like to try growing some nice sized pumpkins in your backyard this year. So if you want a nice 20+ lb. pumpkin to carve this year, check out our seeds! Click on the banner below to purchase! 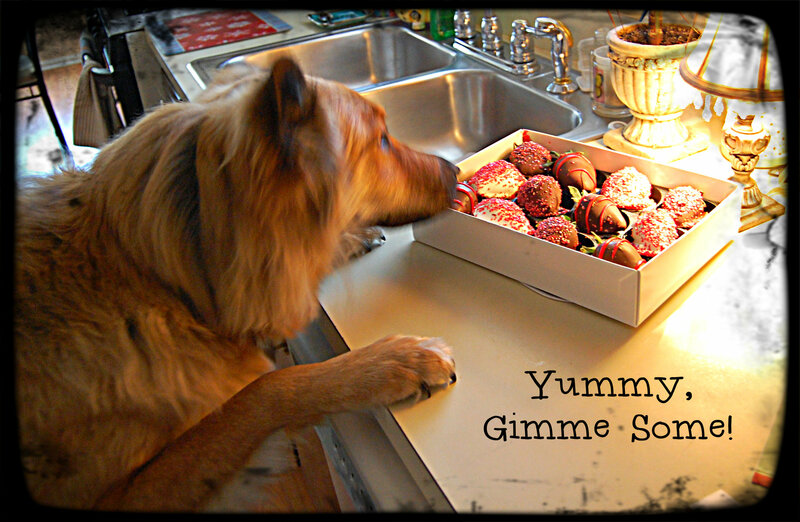 Yesterday was VAL-entine’s Day and my Daddy surprised Mommy with huge chocolate strawberries that were delivered to her yesterday afternoon – WOW, what a surprise for Mommy! Of course, I have to investigate every box that enters our house, so I did some major sniffing when this one arrived. Mommy opened up the box and went WOW! She was surprised at how huge these strawberries were and of course, Mommy got a plate and had to try one immediately! She phoned Daddy to thank him, but he was super busy and in a meeting, so she had to leave him a voicemail. Mommy turned her back for only a few seconds, and I was up on the counter – sniffing away at the box and she snapped this photo of me, but grabbed the box away from me fast before I could get my tongue all over that corner strawberry! Rats, but it was quick thinking on my Mommy’s behalf because chocolate is deadly to us dogs. Phew, thanks Mommy! 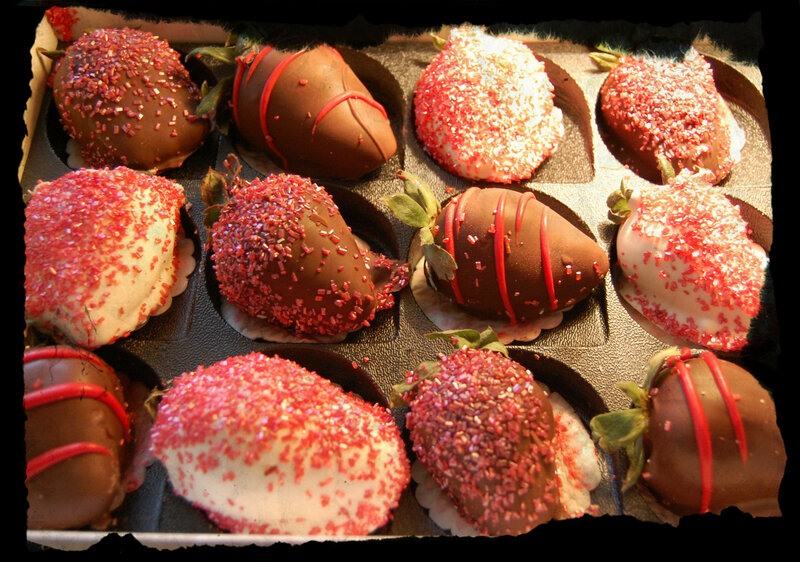 Thanks again Daddy for the wonderful & delicious surprise! As for me, my day started off rough, as I threw up in the kitchen. My tummy was not feeling well when I woke up, so I did not eat any breakfast, but I made a mess for Mommy to clean up. (Sorry Mommy) But, by 11:30, I was ready for breakfast and back to my normal self again! I am not sure why certain toys of mine “make me crazy”, but my hedgehog turns me into one crazy dog. I grab that thing in my mouth and shake it like a run over piece of road kill, I throw it up in the air, catch it, and run down the hallway with it while I snort away. Silly me, eh? Sometimes, I get so crazy with Hedgie, that Mommy has to take him away from me to settle me down. The snow doggie that Mommy and I made yesterday, has already started to melt, as we are watching it from the front window as piece by piece falls off – an ear, the tail is leaning now, and just a few moments ago, the head of our snow doggie fell right off. Bummer! That was our best snow sculpture ever and it got lots of “head turns” as people walked by and drove by yesterday and today. That’s ok, if it snows again, we will have to make another one! Group Night will be interesting none the less, as there is “always” someone in the group who THINKS they are better than the rest and their attitude will always ruin it. 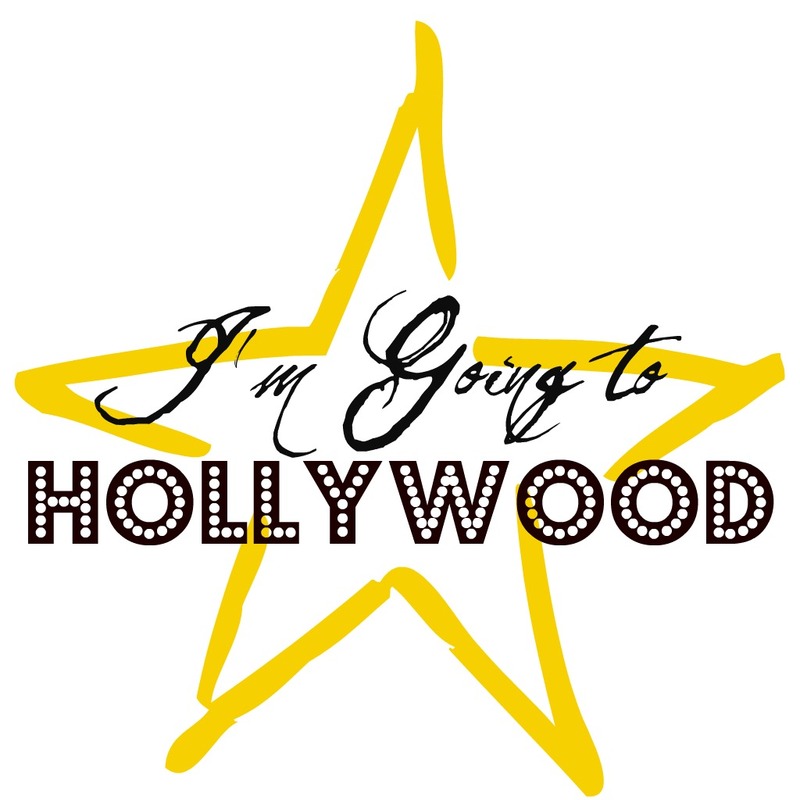 They should sit back and listen, take everything into perspective, and just be happy that they actually made it to Hollywood in the first place. We’ll see what happens in a few hours…. stay tuned! And last, but not least, I wanted to give you an update on our pumpkins that we started in little pots, as they are over 14+ inches in height now! WOW! 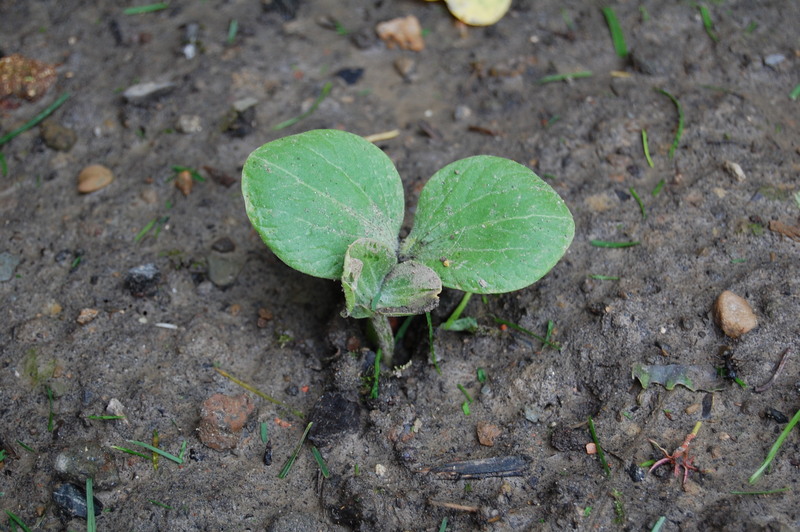 They are sprouting their secondary leaves right now and if you remember from our experience last year, our secondary pumpkin leaves got over 17″ in width. We started our little “kins” early just to see how well they would grow indoors before we planted them outside, and we are glad to see that they will be a big hit in the garden this year! 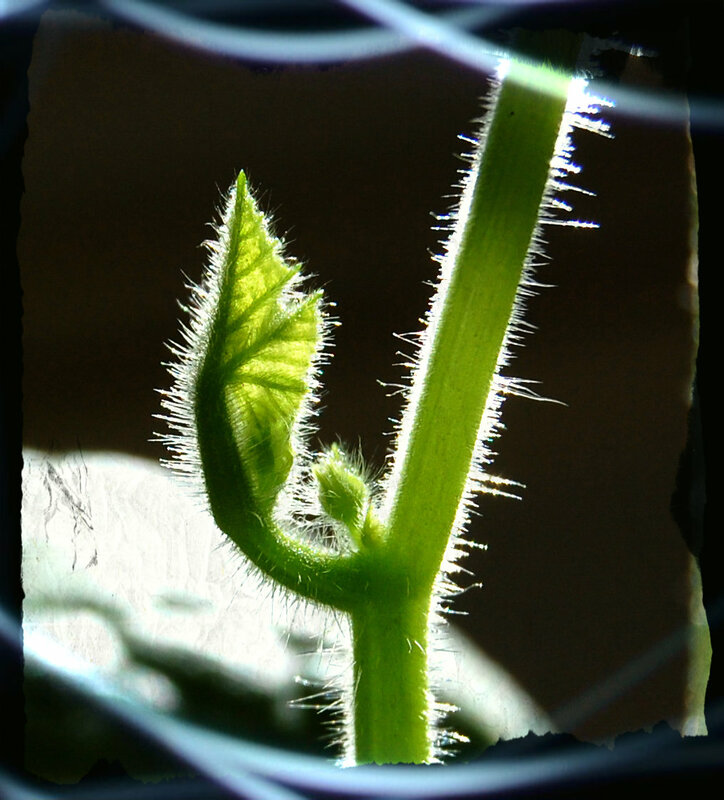 Don’t you just love the little “fur” (as we call it) on the pumpkin stalks? It is official…..Punxsutawney Phil saw his shadow this morning in Pennsylvania. 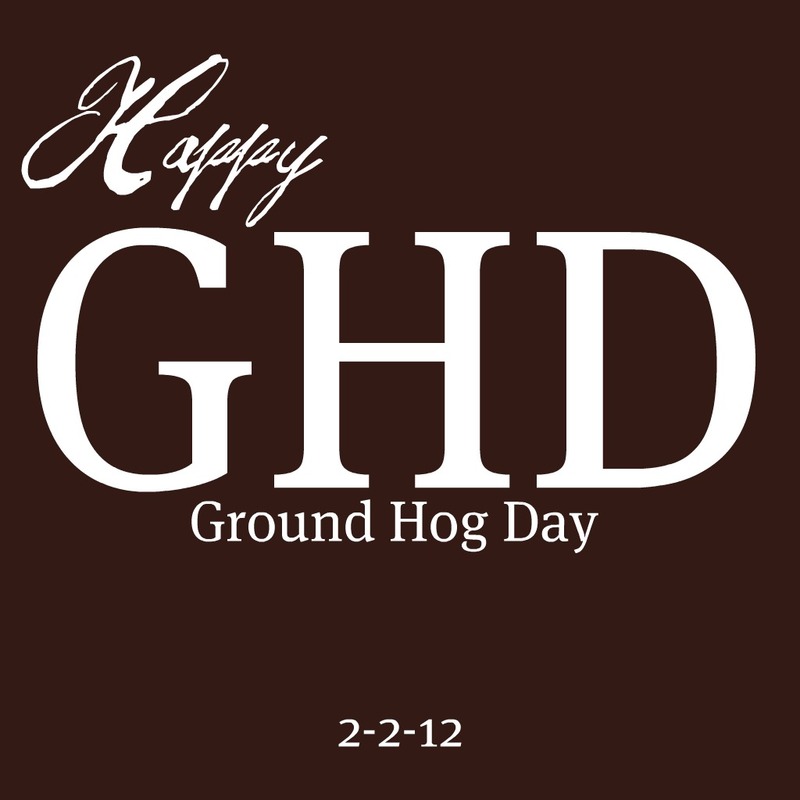 This was the 126th celebration of Ground Hog Day. Sorry everyone, Phil is never wrong, so we will have six more weeks of winter! You’ll have to put your Spring fever on the back shelf for a little while longer. Don’t put your snow shovel away yet! As for us, we definitely have Spring fever, as we have been doing a lot of research on gardening, more specifically, raised garden beds, as we will be adding one to our backyard this year. We decided that we are going to plant the things that we normally get at the grocery store and save a bunch of money by growing our own red peppers, cucumbers, onions, tomatoes, and strawberries. (and of course, MORE pumpkins) We will definitely share with you photos of our garden install in the Spring, so keep an eye out on that! Remember last Monday we planted some pumpkin seeds? 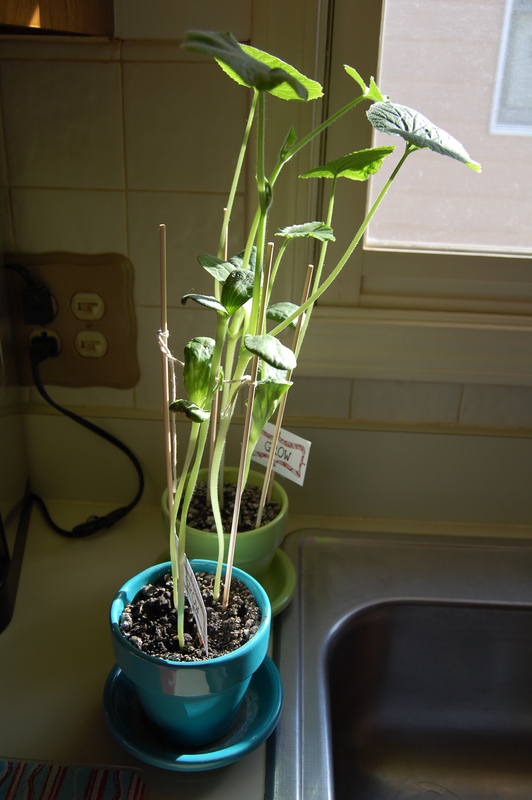 Well, it took them only four days to emerge from the soil and now, they are approximately seven inches high! Holy cow! 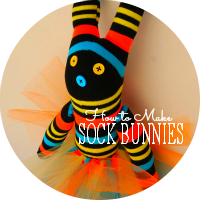 They are growing by leaps and bounds and we measure them every day to see how much they have grown. Check out the progress of our “kins”! We know what you’re thinking… it’s too early to grow pumpkins now, but we could not resist. We love the Seasons, and we love everything to do with Halloween, including pumpkins! Last year was our first attempt at growing pumpkins in our backyard, and if it were not for the deers in our neighborhood, we could have produced more than one pumpkin. 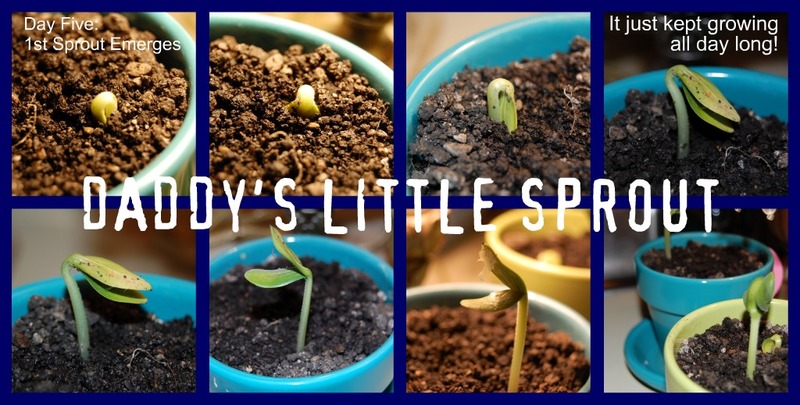 Anyhow, on Monday (1/25) Mommy planted 2 seeds from her store bought pumpkin in a little green pot, and she planted 2 seeds from Daddy’s home grown pumpkin in a blue pot (Daddy’s seeds are the Connecticut pumpkin seeds which he produced a 20.4 pound pumpkin). 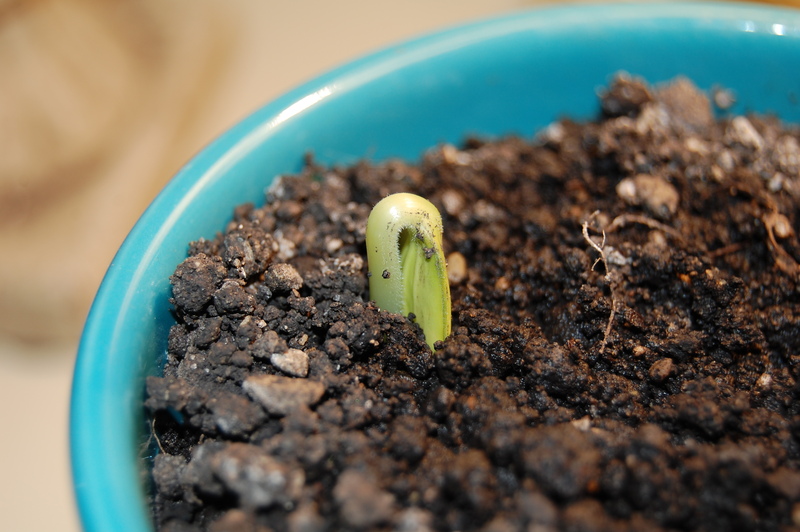 On Friday (1/27) to Mommy’s surprise, she saw her first sprout starting to emerge from the dirt. Holy cow! 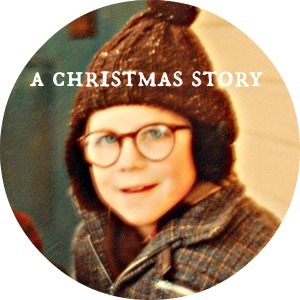 Mommy said, as she stood there in shock looking down at the first sign of life from her little sprout. Only four days and these little suckers are growing, now that is quick germination! 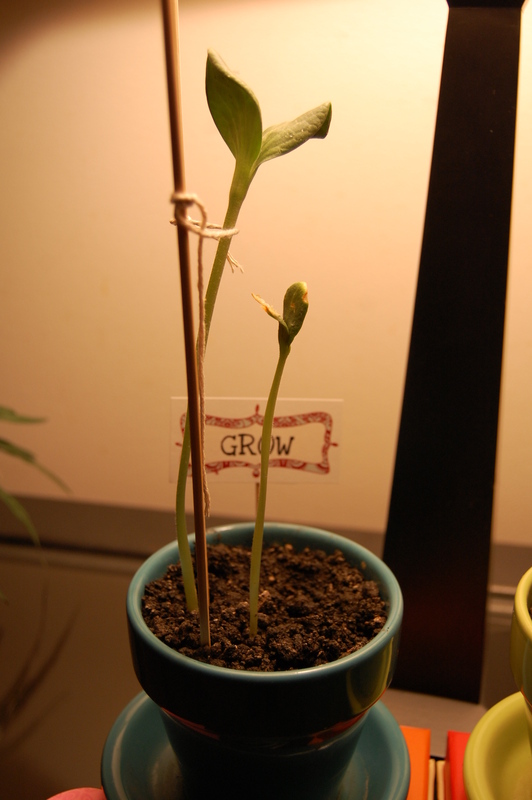 Daddy saw his first sprout emerge the next day on Saturday (1/28). We watched these little sprouts all day on Saturday and could not believe how fast they were growing. Walk away from them, then check back about an hour later, and they grew some more! We also have a small little lamp with a 25w bulb sitting over these pots, so it keeps them warm and provides simulated sunlight during the day to help them grow. 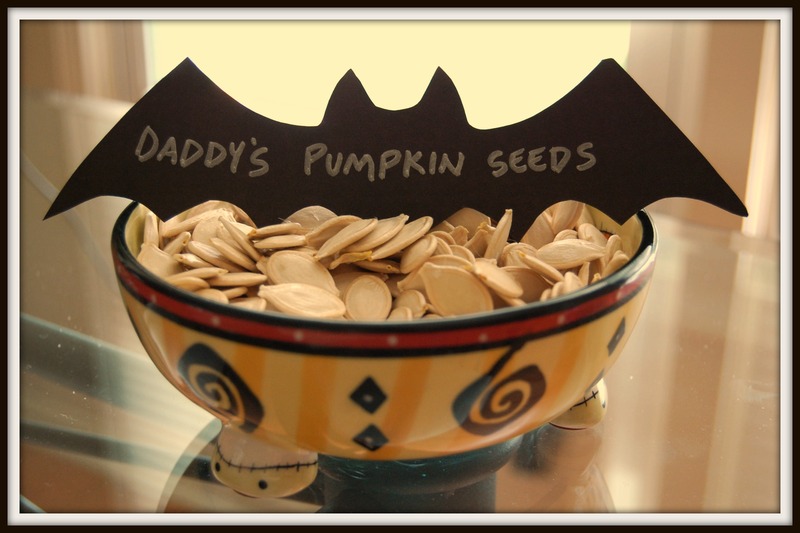 We wrote a post last year on how to dry pumpkin seeds, as we saved each and every seed from our store bought pumpkin and Daddy’s home grown pumpkin, which turned out to be over 1,000 seeds! We know for sure that we did everything correctly on how to dry the seeds since these little sprouts are now growing quite nicely & quick too! (Click on our link to read how to dry pumpkin seeds) This year, what we are going to do differently is start our pumpkin seeds indoors to get the little sprouts big and healthy first, then we will plant them outdoors when the time is right. I think we tried planting our seeds last year in May, and the May rains drowned out the little seedlings, so we had to replant. 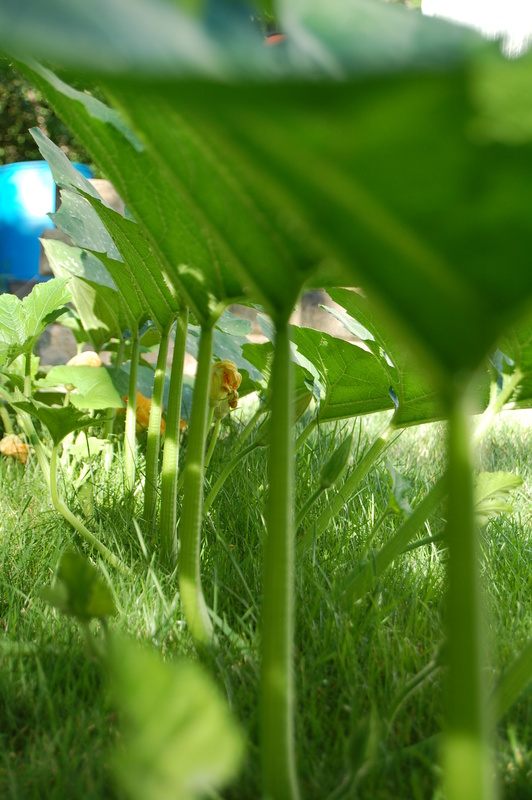 Good healthy soil, good irrigation, bee pollination & lots of sunlight (and deer repellent) is a must for pumpkins to grow well. (Note: If a bee does not pollinate the flower on the vine, then you will not produce any pumpkins!) We learned some valuable lessons last year trying to grow pumpkins for the first time, so we won’t make the same mistakes this year. We probably would have had more pumpkins if it were not for the deer who ate our pumpkin vines. (Darn deer!) This year will be different because we will be sectioning off the area of our backyard with a fence so the deer won’t be able to get anywhere near our pumpkins. If you are interested in purchasing any of our pumpkin seeds, contact us today! Keep checking back to see how our little sprouts are doing! 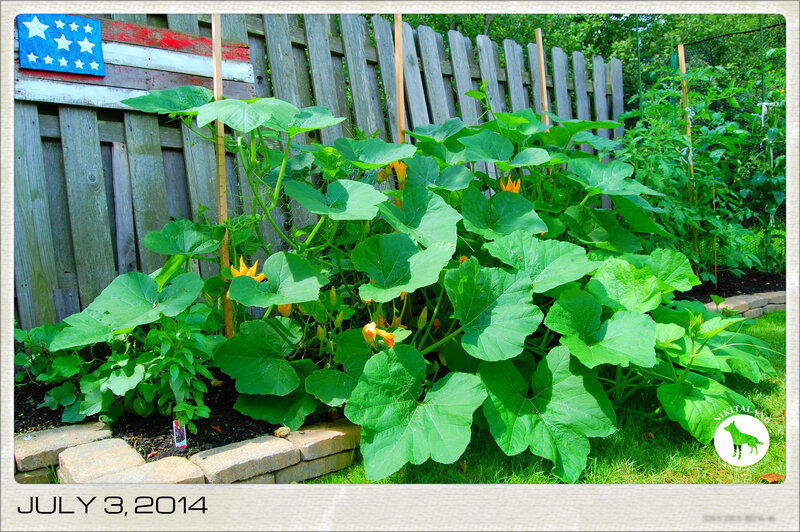 Trying to grow pumpkins was a great adventure for us this year, with a few setbacks from some critters & the weather. We started our plantings back in May, but all the rain stunted the growth and we had to replant. 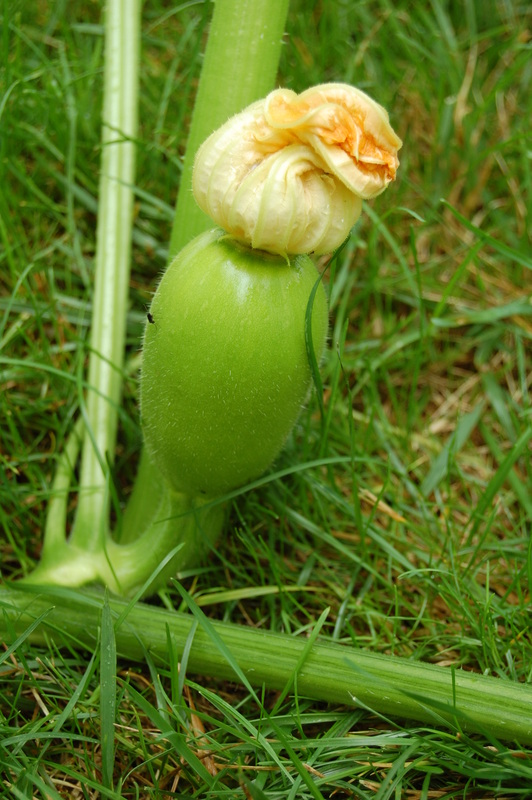 We ran into chipmunks who ate our little seedlings that were starting to grow, and then the most horrible day arrived when one morning we noticed that the deer had a feeding frenzy over night and ate half of our pumpkin vine. We were devastated, but things ended up ok as we got one pumpkin that weighed in at 20.4 pounds! We probably would have had a few more pumpkins mature if the deer would not have stunted the growth of the vine, but for next year we have a new game plan. We are going to cage in the area where the pumpkins will be growing to keep the deer out, and instead of starting the seeds outside, we are going to start growing them indoors first. It was really hard to put the knife into our home grown pumpkin to carve it for Halloween, but that’s what you do – you carve a pumpkin. We have done a lot of research to find out how to prepare your pumpkin seeds to be used for planting and we wanted to share them with you. Never in a million years would I think that I would wake up today and have my day start off this way. 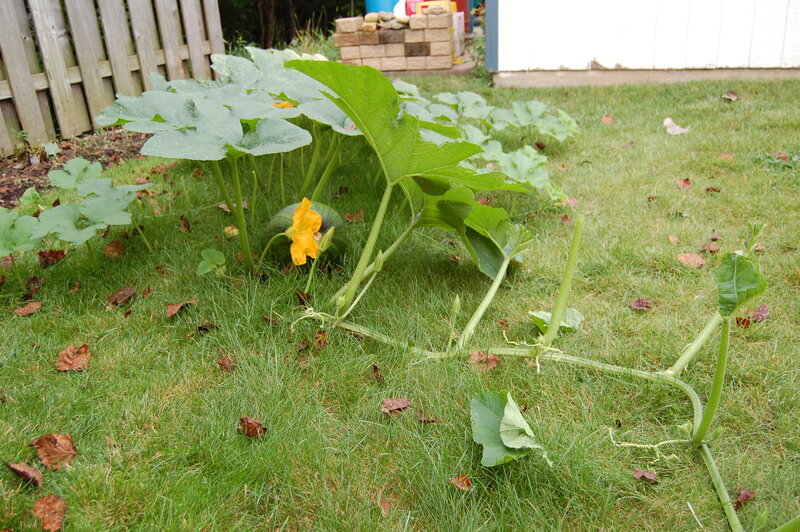 I walked outside this morning with Mommy for my morning pee break only to find that last night, the deer munched away 1/3 of Daddy’s pumpkin vines. The funny thing is, is that I was going to do a post today about how well Daddy’s pumpkin was doing and some nice progression photo’s, but today’s post turned into sadness as what we found was disturbing. We are in shock. 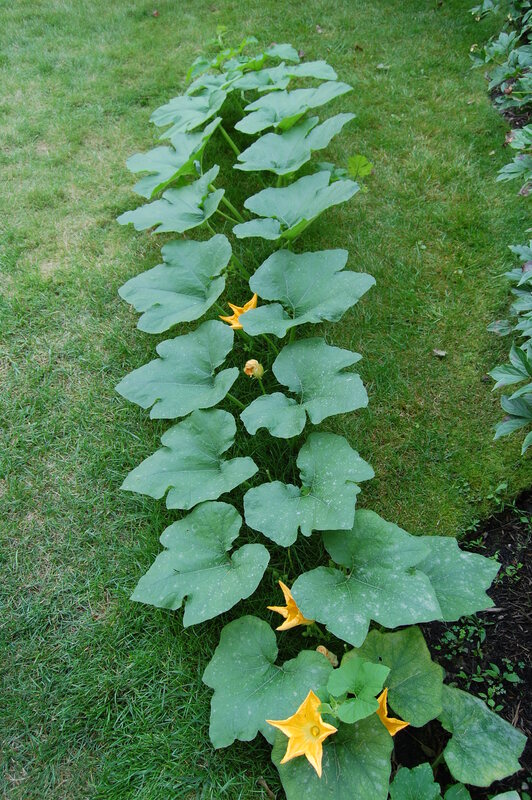 We have been babying this pumpkin from the start, and were so glad that it took off so well, as it has grown to 19′ in length and the leaves reached 17″ in width. The deer have left this alone, until last night. 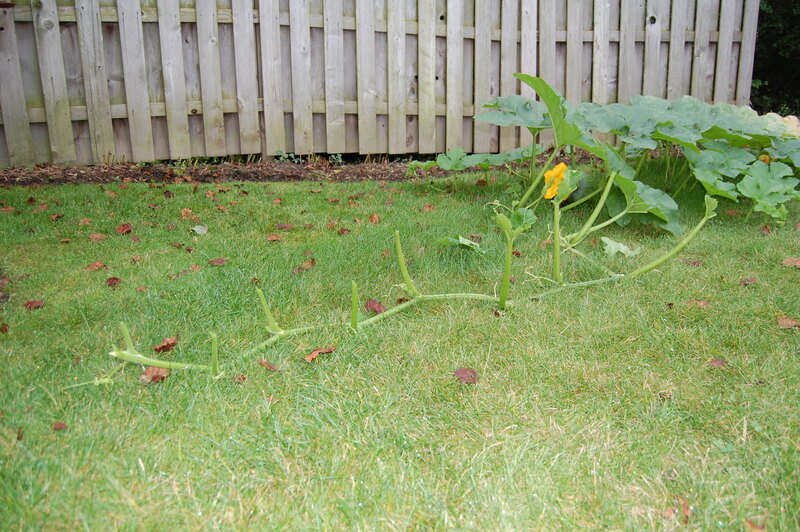 Now, we are wondering if what the deer munched on will effect the pumpkin vine and stunt its growth? At first, Mommy thought that the deer ate the big pumpkin, but was glad to see that they did not. (phew!) That stinky deer spray will definitely be sprayed all over the vines today and we hope that will deter them from feeding again on Daddy’s pumpkin. 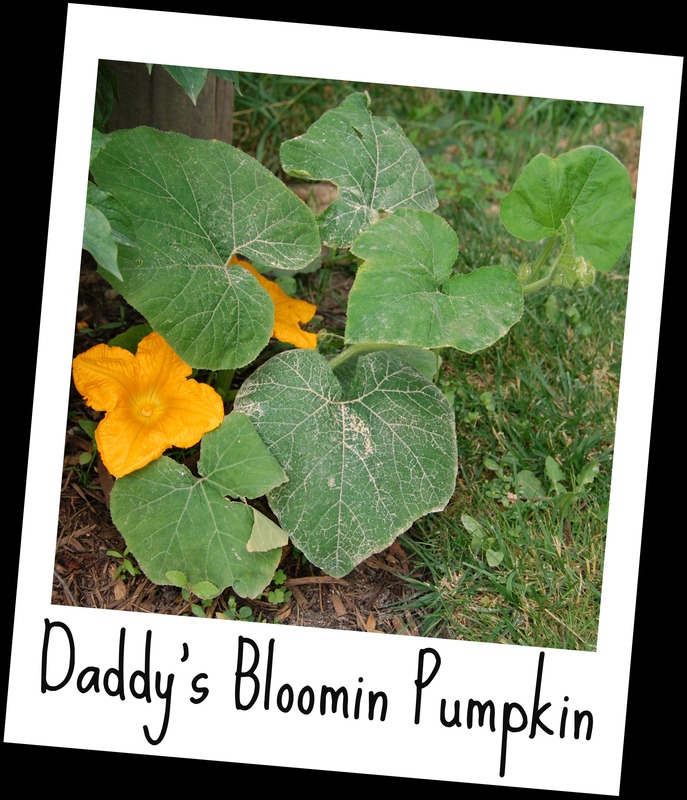 In the whole fun of Halloween, Daddy had a dream and wanted to try growing some pumpkins for us for Halloween. We started our first planting back in May, but the downpours we had and the water that saturated quite everything, we had a slow start, as our first batch of seeds rotted from all the water. 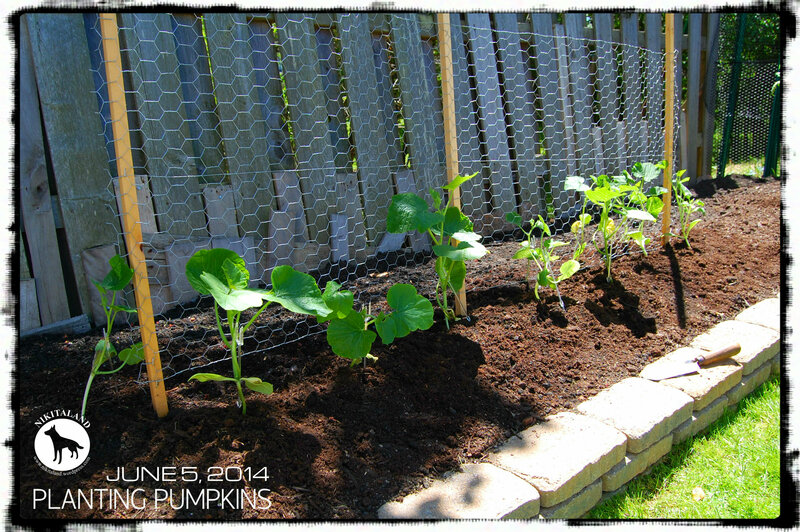 So, Daddy re-planted another batch, and waited, and waited, and finally, we saw some little pumpkin sprouts starting to emerge – YIPPEE! 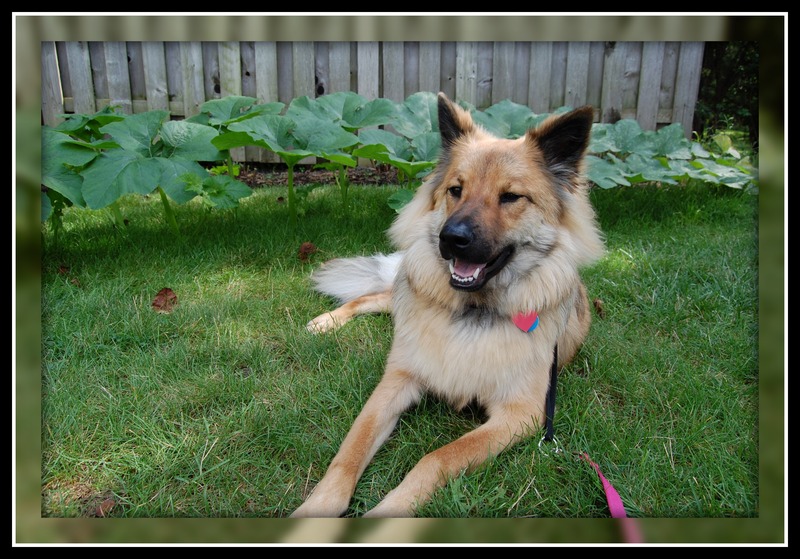 We thought we were on our way to watching our pumpkins grow, until we ran into another snag – deer & chipmunks! Those buggers ate the little sprouts as fast as they came out of the ground, one by one. We were so disappointed. We even tried that smelly deer spray on the sprouts, but to our surprise, they ate the sprouts anyways. Geez, now what? So, we waited a little longer, and some new sprouts came up. It seems like it has been an eternity since we planted these seeds, as we watch them every day, make sure they are watered properly, and remove all the weeds from the flower beds they are planted in. With each new passing day, we do see improvement. We did lose one little pumpkin (the first one that started to grow) because it turned yellow. Since then, we now have two pumpkins that are growing! 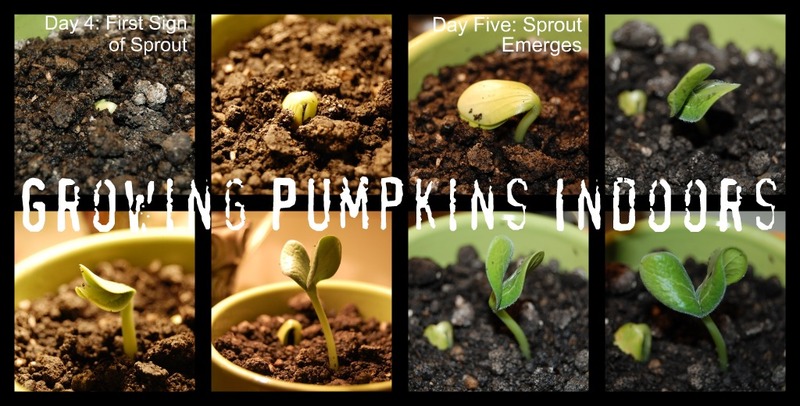 We did not know what to expect when we started this adventure in pumpkin growing, but it has been fun checking each day on the status of the little “kins”. Our pumpkin vine is almost covering our whole backyard from one end to the other, and we are going to have to turn it soon to start running next to the side of the garage. Not sure what we are going to do when it grows all the way up to the house! Ripe & Ready to Pick! Gardening is great! It seems to always be a lot of work getting the yard ready for Summer, but for those of us who enjoy it, it’s not work at all, but pure joy! 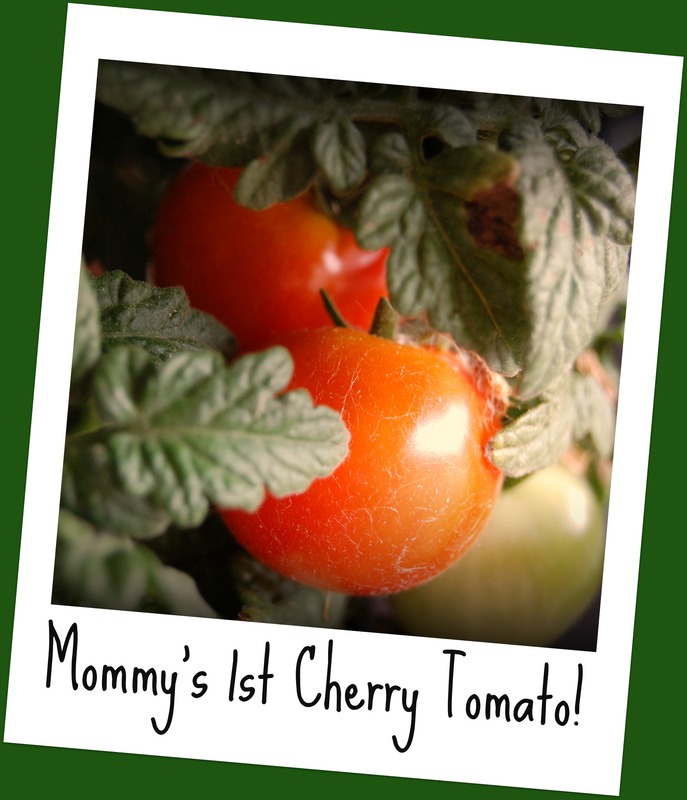 For example, for the first time ever, Mommy finally got two baby cherry tomato plants that Daddy picked out for her, and it was her first time ever that she tried “container gardening”, and today will be the first time that we can pick our first two cherry tomatos! Mommy has been babying her tomato plants and actually brings them in every night so the deer won’t eat them. So, all of her hard work is finally paying off with her first two tomatoes! Even Daddy got into the fun and planted some pumpkin seeds! He started his seeds back in May, but with all the rain we got, it actually killed out the seeds, so he planted yet another whole pack of seeds and had success. Now, if we could only figure out how to keep the little rodents away from eating the little pumpkin plants that are sprouting, that would be awesome! Since Daddy and Mommy love Halloween, they decided that they would try some pumpkin seeds to see if they could grow their own pumpkins to carve on Halloween! We’ll have to keep you informed on how that goes! Daddy’s prize pumpkin (the largest one) actually has some huge blooms on it, so we think that we’ll have a chance with this one! 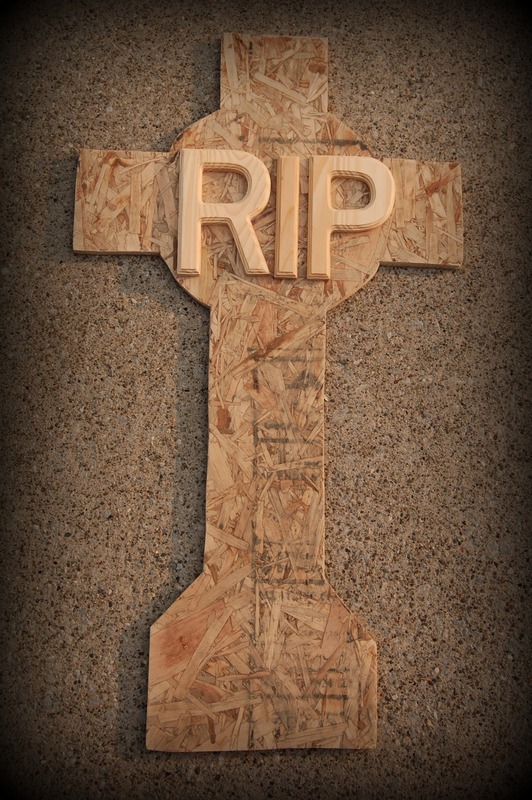 Mommy is still cutting and sanding tombstones! 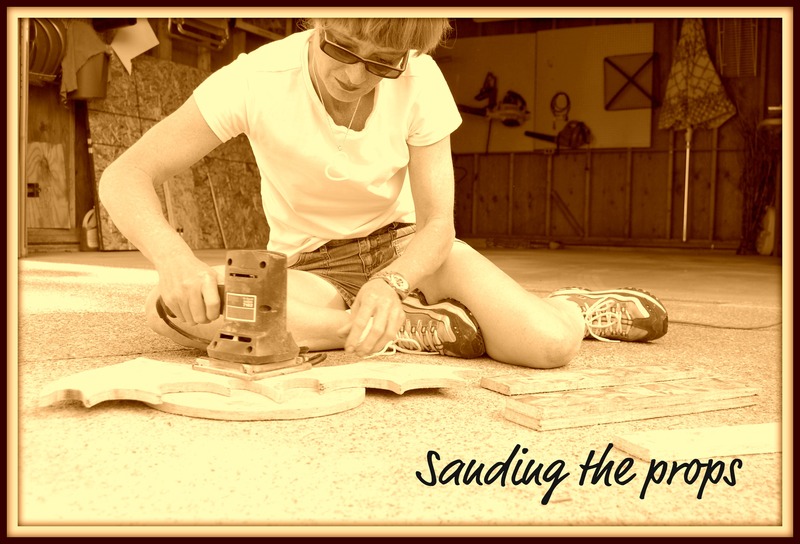 She has about 10 cut & sanded so far, and they are looking great! Daddy & Mommy went to Pat Catans and purchased some 6″ wood letters R.I.P. to add to the tombstones for some flair. If anyone has any suggestions on what she can add to the tombstones or any great websites to share, let her know. How do you think she is doing so far? By the time Halloween rolls around (which is only 115 days away) she’ll have tons of new tombstones for the front yard! Well, the weekend is upon us and I can’t wait to see what I’ll get into – – probably another trip to Disneyland (aka PetSmart) and I’ll have to start checking out the toys they have so I can tell Santa what I want for Christmas!